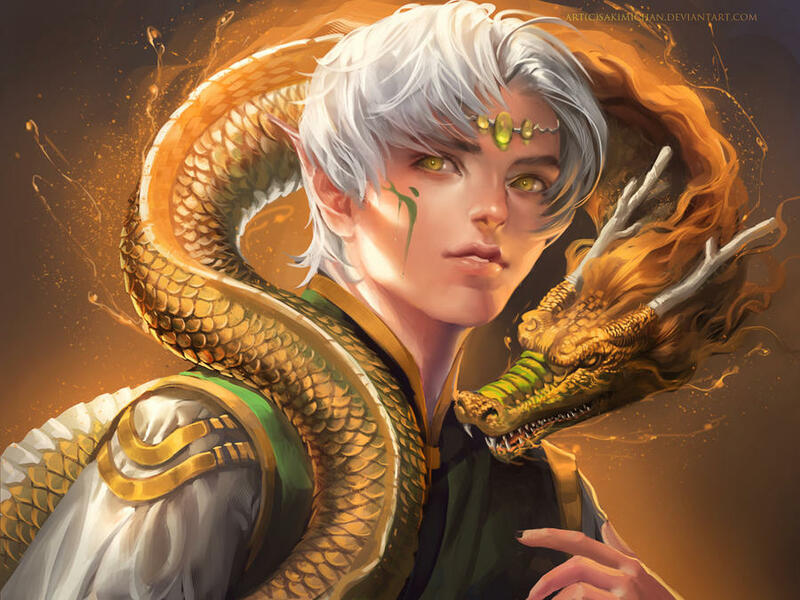 I really like the art and overall flavor of the card here, a very nice representation of a dragon and its companion. A “vanilla” 4/4 flier and “indestructible” 1/1 seems kind of plain mechanically, especially for a legendary, but I suppose it will be at a good power level in an actual game. 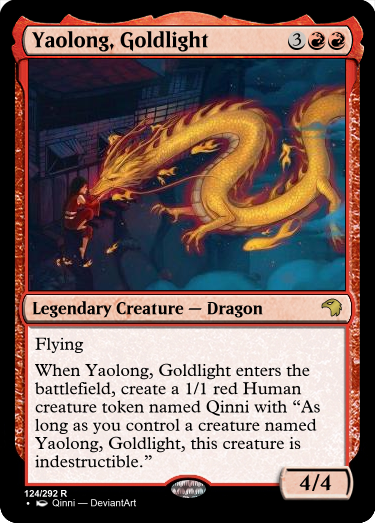 Yaolong will probably be swinging in, but Qinni can also block effectively. One complaint is that while the card can be justified in red, it feels like it would fit better in white. When Inspiring Griffin enters the battlefield, creatures you control get +1/+1 until end of turn. This feels pretty under-rate for 2WW, especially since Silverbeak Griffin is now at common. This could be a 3/2 pretty easily, or be dropped down to three mana (1WW?). Either one of those changes would make it an excellent fit in limited, though. Nice flavor. 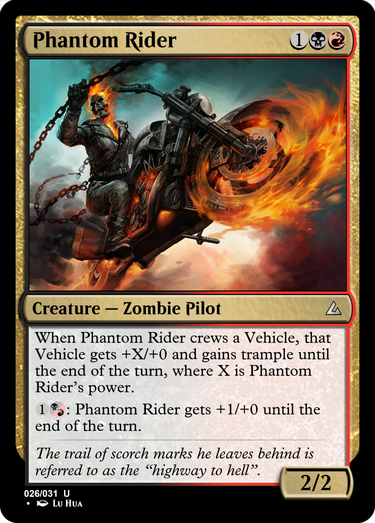 This feels a bit underpowered at 1/1, especially since wotc has been pushing the standard 1/1 flier for W. At the same time, it does have artifact synergies, so whether it’s 1/1 or 1/2 probably depends on the block. Whenever ~ attacks, you may tap target creature. A shining beacon for its allies; a blinding nova for its foes. Hm. 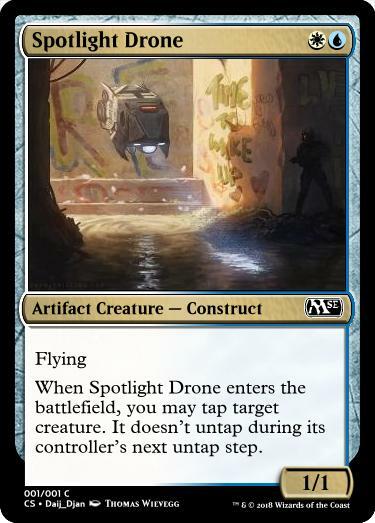 I’m not sure how much I like a “tap on attack” creature having flying since it removes the downside of having to care about the rest of the boardstate. If a player can attack with Star-Crowned Stag (and other creatures) into two 4/4s, they need to consider whether the ensuing death will be worth the damage. 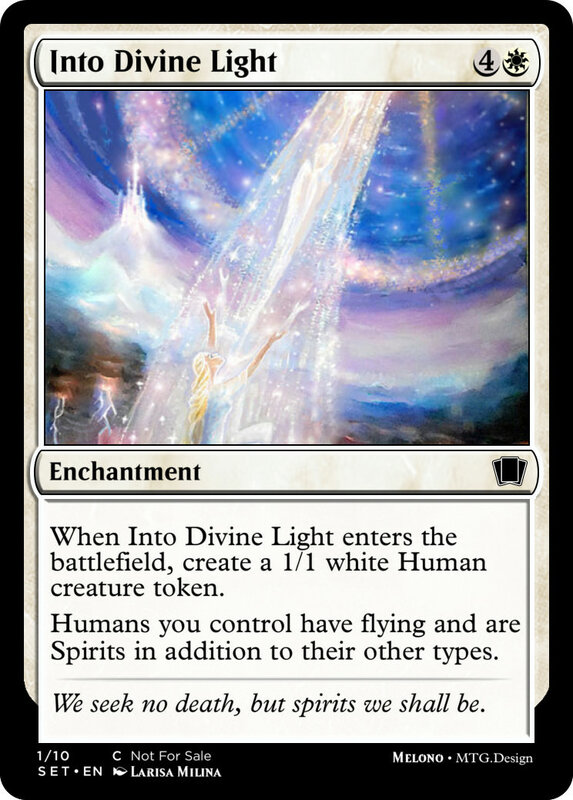 Since the Illuminator has flying, however, as long as the 4/4s don’t, it doesn’t care at all and just acts as a free “target creature can’t block this turn” every turn. 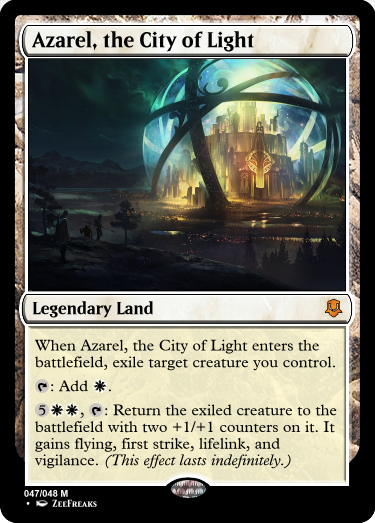 Since it has modular, I’d assume it’s appearing in a set with an artifact theme, which makes the white effect on a colorless card a little more passable, but again, it’s stronger than the outcome usually gets so I’m wary. When ~ enters the battlefield, create a 1/1 white Human creature token. Humans you control have flying and are Spirits in addition to their other types. We seek no death, but spirits we shall be. There would have to be a significant human tribal element in a set before this would come close to seeing play, as a 1/1 flier is below rate for even one mana. In addition, granting flying to a set of creatures (permanently) is typically uncommon (Abzan Falconer) so I’d bump the rarity up. Uncommon is also a good place for payoffs like this one in general. There’s a few ways this could be buffed, such as making two tokens or just reducing the cost. The flavor is interesting, but the execution is quite underwhelming. Interesting drawback for an etb untapped nonbasic. The payoff lategame is certainly strong, but the cost in the early game is quite large. The City is a little awkward because the decks that would be able to activate the ability consistently also likely don’t want to lose a creature (midrange/control), and the decks that can afford to lose a creature are less likely to hit eight land drops. Thank you all for good entries! LIMIT #32: Get out! Your card involves exile. Start it off with a bit of an odd one. At the beginning of your upkeep, if Flashes of Memory is in exile, return it to the battlefield under your control. While Flashes of Memory is exiled, opponents can’t cast spells or activate activated abilities of permanents they control. 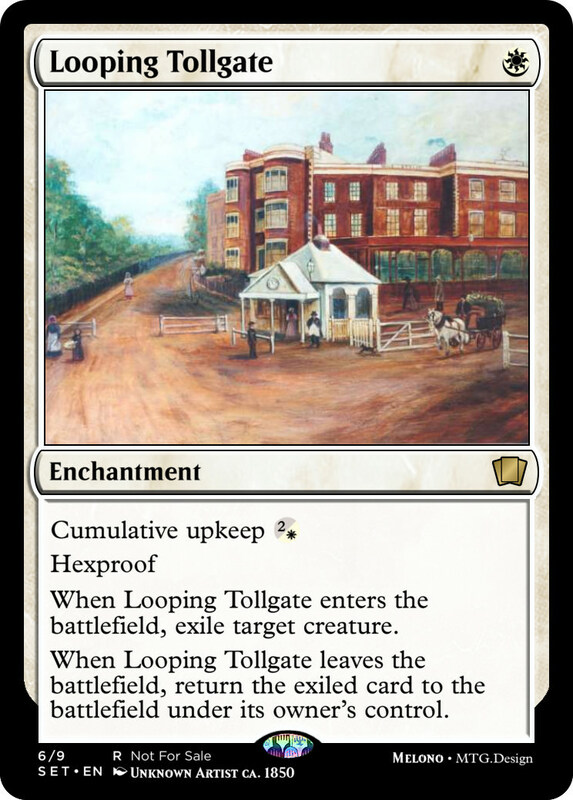 Until your next upkeep, your opponents can’t play cards from exile. I hope happening until the upkeep counts as happening at the beginning of upkeep? 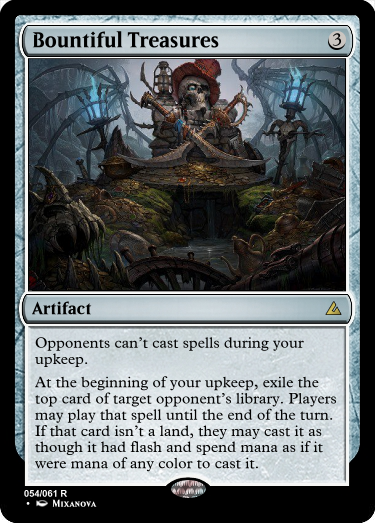 At the beginning of each upkeep, exile target card from a graveyard, then choose color, converted mana cost, or card type. Your opponents can’t cast spells that share the chosen value with the exiled card until end of turn. @monger : Thanks for the feedback, glad you liked my card. I did ponder quite a lot about adding a second point of toughness, but decided to play it safe in the end. Looking back at it, in a vacuum it feels like 1/2 would have been the better choice indeed. And yes, the green Suspend cost is intentional. While Silence normally obviously is a white effect, considering it'll only work during your own turn after being suspended makes it work in green as there are a few similar designs in green to prevent your opponents from messing with you during your turn. EDIT: Also I'll update the first post with the full limit list in a bit. @Fermat: Rebound is a cool idea to fulfill the first to limits as well, but your entry misses the third one. Crap. I though it was just "can't." Edited. When ~ enters the battlefield, exile target creature. 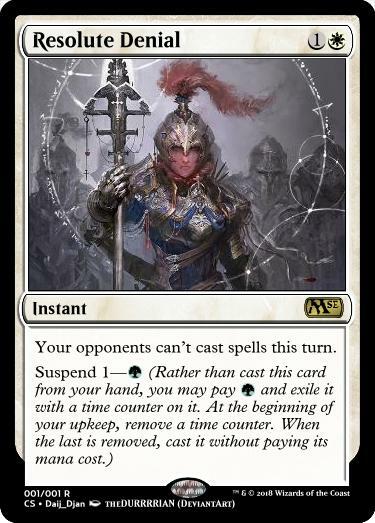 When ~ leaves the battlefield, return the exiled card to the battlefield under its owner's control. PS: the art literally has no known artist. I found it on a site called ideal homes. Jartis, This one also requires something that does the exile of the enchantment. Without that, it doesn't actually do anything. And the 1 converted mana cost means if you do have a combo for exiling it, it's really cheap to start. It's actually too strong once it gets going. Flo00, I think it could just be "Until your next turn" but even then it doesn't really *do* anything since playing from exile is... rare. gluestick248, This one is different. I like that. I'm not sure about every upkeep, and it should probably be nonland, but it's unlike anything i've seen before with the chosen value matching. Daij_Djan, I said "nope" when i first read this. lol. Then i reread it twice and said, "oh!" White instand speed, green sorcery! That's great. gateways7, Why can't opponents cast spells during your upkeep? They still have later in your turn to cast their own card? And "players may"? I can see that leading to a lot of timing confusing. This is one I'd want to playtest to see how it actually works out. It reminds me of Ornate Kanzashi. Fermat, That works. I'm not sure I'd care about the rebound effect on my turn, but that's still a crazy powerful fog. melono, First read... "that's too powerful". Then I saw the cumulative upkeep (hello old friend). Okay, now I'm on board. Hexproof on a white enchantment? Only green really cares? Overall I still like it. Winner Daij_Djan, simple design wins. viriss Yea, felt a bit like cheating to do it that way. It's usefulness depends very much on the environment. It completely stops suspend and impulse draw. LIMIT #20:	From 20 to 0: your card can hypothetically kill your opponent in one swing. LIMIT #28:	Your card uses hybrid mana. I'm not too proud of this card and I might take more time to design something better, but this immediately popped into my head reading the challenge. Only one creature may attack each turn. Whenever a non-Vehicle creature attacks, its controller sacrifices it and it deal damage to the defending player equal to its power. Whenever a Vehicle attacks, its controller sacrifices it and all creatures that crewed it. Each creature sacrificed this way deals damage equal to its power to the defending player. : ~ gains flying until end of turn. Activate this ability only if ~ was crewed by a white or blue creature this turn. : ~ gets +1/+0 until end of turn. Activate this ability only if ~ was crewed by a red creature this turn. : Untap target creature that crewed Boros Response Unit this turn That creature must attack or block this turn if able. Until end of turn, Boros Response Unit gets -Y/-0, where Y is that creature’s power. This was originally Furious (of Fast//Furious), but Fast was uninteresting. - Destroy target Vehicle or artifact creature. - CARDNAME gets +2/+0 until end of turn. Agreed! Still, today is reserved for CotW stuff - so get your final edits and entries in, everybody! This challenge will be closed tomorrow! EDIT: Well, I'm a day later than expected - but this challenge is now closed. Please no further changes of entries! Yeah, sorry about that. As I've been a bit lazy in terms of writing full judgings as of late I really wanted to do one here - but then my computer broke down Thankfully everything has been fixed again, but I have some backlog to take care of. So for today, I'll again simply declare the winner - and then add some comments either tomorrow or by Tuesday (as Mondays are reserved for CotW stuff obviously). We had some interesting entries around this time - all of them featuring mana - but in the end I decided to give the win to gateways7 . Thank you so much for the win Daij_Djan! This was a fun challenge. Here's your next set of limits! LIMIT #05: Your card uses a completely new keyword of your own invention.